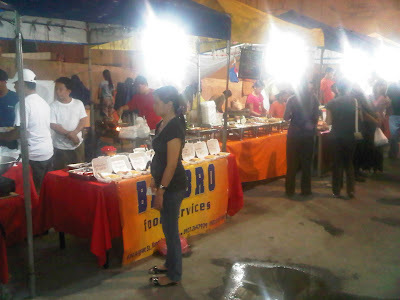 Update (February 09, 2011): Banchetto opens third venue!!! Fellow bloggers Franny, Richard, and Calvin have been mentioning Banchetto for quite a while now. Finally, I have had the chance to try it myself at its Robinsons Forum branch. What is Banchetto? It's an Italian word that means "Feast." A portion of the street is closed at certain hours of the night till wee hours of the morning for a feast of different food. They serve different kinds of food - fish balls, squid balls, quekiam, hotdogs, fruit shakes, barbecue of all sorts, spaghetti, macaroni, lasagna, burgers, sandwiches, lechon, inked squid, veggies, brownies, mango dessert, iced tea, orange juice, shawarma, putubumbong, and a lot more. Since there are lots of people working on night shift around the area, the tables and chairs in the block could get easily filled up. You could just share a table with other foodies, so you don't have to eat your food standing. There's also an option to take it home, of course. 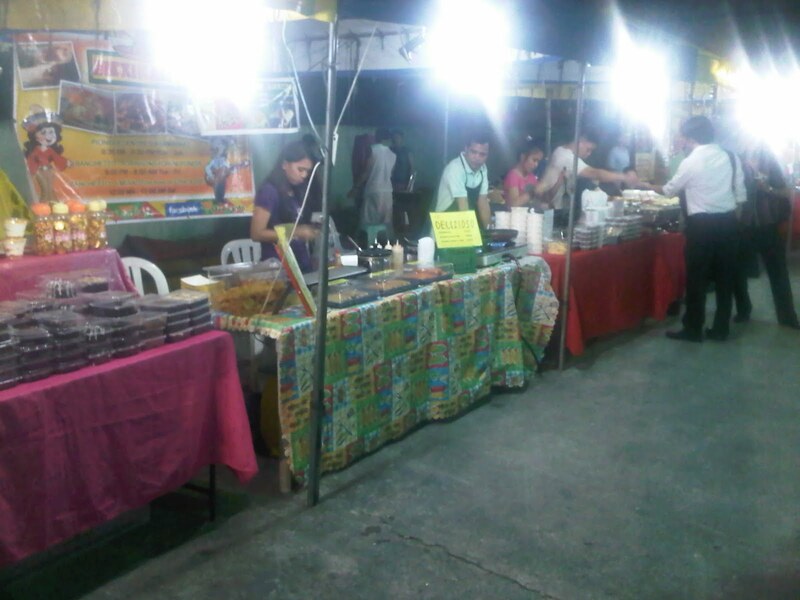 Prices of the food range from Php10.00 to as much as Php100.00, depending on what you will order. I myself went around several times, since I had a hard time deciding what to eat. 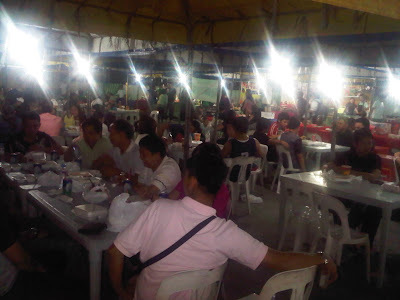 At present, Banchetto is celebrated in two main "branches" -- one in Robinsons Forum (at the back of Go Hotels) and another in Emerald St., Ortigas. 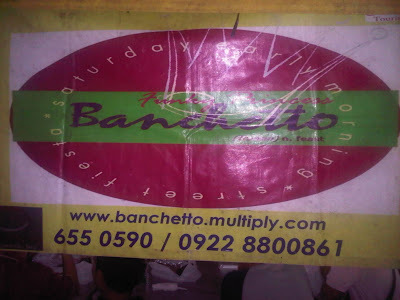 Sad News: Banchetto Forum has previously been operating from Tuesdays to Fridays; however, due to the concessionaires in Cybergate Building getting alarmed at their low sales, management has decided to cut the down the operations to just Tuesdays and Wednesdays (8:30PM to 6:00AM), effective immediately. Previously (October 1, 2010), four nights were cut down to three nights, and now further trimmed to two nights. Good News: Banchetto Emerald will still be ongoing every Friday from 12:00 midnight to 11:00AM the next day. 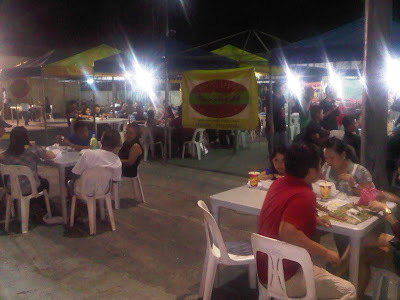 New Good News: Banchetto Libis will be opening soon every Mondays and Tuesdays. This is still being finalized though, as the owner is still looking for a perfect venue for the feast to be celebrated. In my opinion, the food being sold here aren't the ones you can't find elsewhere (of course there are a few). Perhaps, what makes it a good place to try is the experience you gain from buying food off the street and eating them in mono-block tables and chairs with friends and family. P.S. Barbecues are grilled on the spot, so you might leave the place smelling like one. Don't worry, at least you smell yummy! Have fun! Pictures were taken using Blackberry 9700. Ortigas Center, Pasig City, Philippines. I really wanna try Banchetto but pigging out means that I have to bring my toddler with me. The best option is Banchetto Forum while booked at GoHotels. @ La Bella Vita: Hello! Since it opens at night, perhaps you can just go when your kid is already asleep? Hehe. It was my first time and I only ordered baked mac, lechon, isaw and orange juice, hehe. My sons want to eat here but we don't know where these are located. Thanks to your blog, we can now pig-out. Will try Banchetto this friday! I cant wait!